IFC, a member of the World Bank Group, brought together CEOs of leading companies to mark the anniversary of SheWorks partnership in Sri Lanka. The partnership, supported by the Australian government, works with 18 leading employers that have pledged to implement measures proven to enhance employment opportunities for women. This dynamic collaboration has led to the companies making 99 gender-smart commitments focused on increasing women’s business leadership, ensuring recruitment and retention of female talent, exploring employer-supported childcare, promoting anti-sexual harassment mechanisms, and supporting women in the value chain. Out of the commitments made, 72 percent have been realized or are ongoing with expected completion by mid-2020. 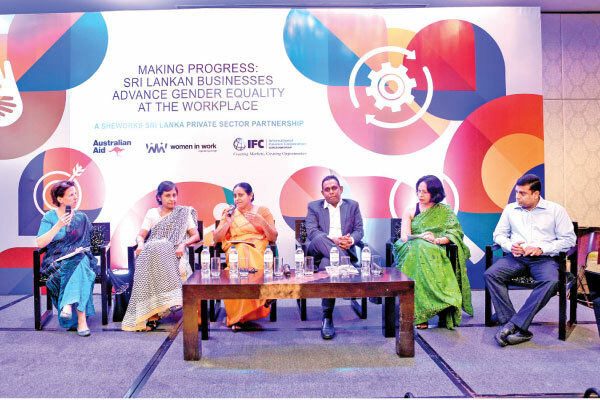 IFC also released a publication, “Making Progress: Sri Lankan Businesses Advance Gender Equality at the Workplacev.” The report highlights that 13 companies have registered an increase in women’s employment from 28 to 30 percent. In addition, the presence of women in senior leadership has increased from 19 to 23 percent, in middle management from 20 to 21 percent, in the executive cadre from 30 to 32 percent, and in the non-executive cadre from 28 to 30 percent. Sri Lanka achieved the Millennium Development Goal of universal primary education, as well as gender parity in secondary education. In contrast, women’s participation in the economy remains stubbornly low, at only 36 percent. IMF’s calculations show that Sri Lanka’s GDP could be 20 percent higher if female workers had the opportunity to participate and contribute to the country’s productivity. The SheWorks partnership aims to bridge this critical gap. The private sector, which accounts for 9 out of 10 jobs in developing countries, plays a critical role in creating better employment opportunities for women. SheWorks is part of IFC’s broader effort to help companies address gender gaps in employment, and thereby drive gains in productivity, competitiveness, and innovation. SheWorks members are spread across Sri Lanka’s different priority sectors, and include 18 companies; AIA Insurance Lanka PLC, Brandix Lanka, CBL Group, Diesel & Motor Engineering PLC, Fairway Holdings (Pvt) Limited, Hela Clothing (Pvt) Ltd, Hemas Holdings PLC, Jetwing, John Keells Holdings PLC, London Stock Exchange Group, MAS Holdings, Melwire Group, National Development Bank, Richard Pieris and Company, SANASA Development Bank, South Asia Gateway Terminals, Standard Chartered Bank, and Virtusa Pvt Ltd.